The kids can see pavement again – and they are raring to go. After a too-long-winter, kids are grabbing their gear – bikes, balls, skipping ropes and skateboards – and heading outside. Except the kids who can’t – and that’s when the Tetra Society moves in. You’ve probably never heard of the Tetra Society – I hadn’t – but this nation-wide group of volunteers is helping people with disabilities modify everyday equipment and make it easier to use. Technology’s ability to improve life for people with disabilities has been making headlines this week as we commemorate the first anniversary of the Boston Marathon bombing and the running of the 2014 Boston Marathon on April 21st. The advances in prosthetics has been rightfully praised for helping people who lost limbs in the bombing regain their mobility. Read between the lines and another story emerges: that living with a disability requires many modifications to a wide selection of everyday tools and processes. It’s about reengineering life. 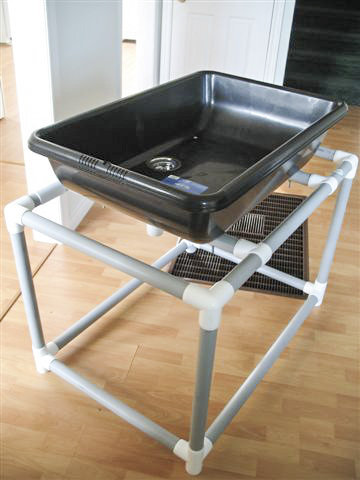 portable stand for parents who aren’t able to either bend over the bathroom tub or stand next to the kitchen table, and added supportive straps to children’s sleds. On the high-tech side, they’ve built adaptive switches to enable people with disabilities to use electronic products. For instance, they adapted an electric toy car to enable a child with disabilities to drive it. “Usually when we get a project, it’s an idea that somebody has themselves, but they may not have the technical knowledge to bring it to fruition, so they need some help,” Plourde says. “So that’s what our volunteers are there too do.” The volunteers donate their time to help design and put together the device. The only cost to clients is the materials needed. Click on the links to join the Fredericton chapter, start a chapter in your community or find out how Tetra Society volunteers can help you or someone you know.